Climb Mt. Ama Dablam in 2007 & 2008 with Tim Rippel since 1991. October 2008: Concerns were confirmed as another chunk broke off the dablam this year. We only heard about it while on Pumori and saw the aftermath on the way out. Ouch! October 2007: AMA DABLAM'S INSTABILITY IS A CONCERN: Global warming is to not be taken lightly when playing in the mountains. Taking risks that we feel we have little control over is not what Peak Freaks is about. We are moving our autumn expedition to Mt. Pumori commencing October 2, 2008. We like it, you will like it, our Sherpas and their families like it and your family will too. Tim Rippel is a certified Avalanche Forecaster and Mountain Safety and Rescue professional and offers his experienced assessment on the need for change. We have a 100% safety record and adapt to change to keep it that way. Even it means giving up one of the most sought after climbs. The effects of global warming in the world of mountaineering is changing fast. Roads in mountainous regions around the world are being blocked from avalanches	and mudslides, The Swiss Alps' icy soil that glues its rock faces together is thawing, causing instability and there is a concern for the future of Ama Dablam. It is quite obvious that the hanging glacier "dablam" will be coming down. But when? Already, Switzerland's Matterhorn had to be closed to some climbing at times because of recent summer rockfall. The Eiger at 3,970 metres above sea level is one of the most renowned mountains in Switzerland, its north face offering ` major challenge to climbers. Just recently it lost a large part of its feature when a huge rock fell off. Climbs scheduled this year on Mount Cook were all cancelled to the top of New Zealand's highest peak because global warming has made it too dangerous. The Linda Glacier, the most popular route the 1745 metre high summit, which would normally be 10 metres thick, was now wafer-thin and climbers had to use a track with ice cliffs prone to avalanches on either side. November 13, 2006- On Ama Dablam a chunk broke off the 'dablam" (hanging glacier) onto Camp 3 killing 3 climbers from Europe and their 3 Sherpas in their sleep. 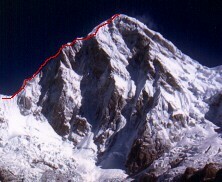 October 18, 2007 a team of Russian climbers were on their way down from the summit to discover their rope had been ripped off the route by the deterioration of the "dablam" while other members were scared off the mountain after a night of ice avalanches passing by to close for comfort at Camp 3. The situation on Ama Dablam is looking grim. There is quite a bit of ice up there. It is a known fact now that the hanging glacier is melting and it will be just a matter of time before nature takes it course and peels off. She has been throwing warning signs at us. For a long time after the route will still be considered dangerous as it will uncover more problems. The ice is the glue and when it is gone there will be rock fall to deal with. This is all normal mountain behaviour caused by warming but there are other obstacles that are not. PHOTO: Hanging Glacier "dablam" and Camp 3. Sure, we can get around Camp 3 and not use it anymore. The climber with good stamina could go from Camp 2 missing Camp 3- summit and return to Camp 2 or even Camp 1 "BUT" this presents the other problem. There is no room! for the 40+ member expeditions that scurry up to grab the very few camp spots available pushing more teams up into Camp 3, the only spot left. Camp 2 is very small with limited tent space and there doesn't appear to be any plans on the horizon for limiting the issuance of permits during the peak climbing season. Understandable, but there are options for us at Peak Freaks. We have been climbing on Ama Dablam since 1996, it is much different today. Crowded routes are no fun, it's time to move on. Another concern developing on Ama Dablam with regards to overcrowding and in particular at Camp 2 is human waste. Toilets have been constructed at base camp and we have advised the ministry of the need for another one, considering the size of the expeditions embarking on the area. This is all good, but what about on the mountain? We feel it is only a matter of time before climbers start to get ill from melting what they thank is clean snow. Camp 2 is not so pretty these days, littered paper and human waste. Certainly not the pristine mountain experience one would imagine from looking at brochures. We have enjoyed three expeditions on Mt. Pumori via the South Ridge. Pumori has been given a bad rap the past few years because of avalanches and deaths via the standard route, the East Ridge, yet expeditions still climb the standard route??? This has had us puzzled for sometime because there are alternatives. 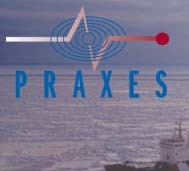 Our expeditions have been via the South Ridge some with success and all without incident. We gave you the BAD and the UGLY and now we will give you the GOOD. Pumori has a very nice base camp area complete with a sandy area gd refer to as the beach. There are no toilets but we have a portable one's that contribute to local composting practices for sustaining gardens in the Khumbu. It is just a matter of time before more climbers start coming to Pumori and we hope to be leaders in setting precedence here for packing human waste off the route as it is done in other parts of the world, why should Nepal be different? We provide our climbers with individual biodegradable bags that completely breakdown in less than 40 days. Climbing with a conscience is what Peak Freak's is about and having low impact on this playground we borrow should be every expeditions priority. When on Pumori we have been lucky in that we are usually the only ones at base camp and on the route. This is safer and works well as a training ground for our aspiring Everest climbers in training. We have plenty of time to stop and take in our environment, discuss techniques, practice and check in with each other and most important have a lot of fun. Climbing as it should be and not a race to get in or out of someone's way. On Ama Dablam we were wasting time doing the long acclimatization climbs up and down from ABC and CAMP1 and it isn't until Camp 2 that we reach terrain that works well for technical experiences to be evaluated. On Pumori we start climbing and learning right away. You are on the route immediately from base camp. Altitude experience: For our Everest training camp this works well too. Pumori is 7145m compared to Ama Dablam's 6846m and every little bit helps. JOIN US 0N......Pumori Oct 4, 2009 & 2010- 34 days.....$6700US all inclusive from Kathmandu. Also ran as our " Everest Training Climb" for aspiring high altitude and new to climbing climbers.